Despite operating in one of the most controversial and heavily regulated industries in America, tobacco stocks have historically been excellent long-term, high-yield dividend growth investments. In fact, Altria (MO) has been the best performing stock of the last 50 years, generating 20.6% annual returns and increasing shareholder wealth a remarkable 6,638 fold. 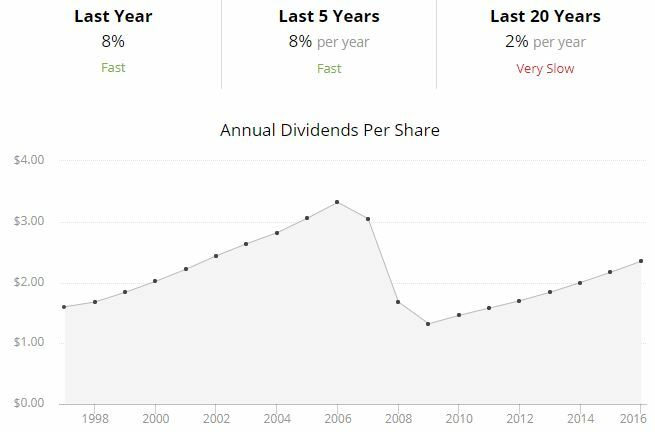 Along the way, Altria has raised its dividend for 48 consecutive years, making it not only a dividend aristocrat, but poised to become a dividend king in 2019. Let’s take a look at how Altria has managed to generate such remarkably consistent dividend growth and market crushing total returns in a declining industry. More importantly, find out if Altria is likely to continue generating healthy total returns and safe income as it deals with changing consumer behavior and new regulations. Founded in 1919 in Richmond, Virginia, Altria is America’s largest tobacco company, with exclusive US rights to sell cigarettes primarily under the Marlboro, Parliament, Virginia slims, and Benson & Hedges brands. In recent years, Altria has been investing heavily into non-combustible products, including its MarkTen vaping products, Verve nicotine tablets, as well as the iQOS “heat don’t burn” nicotine delivery system. The company also owns a 10.5% stake in Anheuser Busch Inbev (BUD), the world’s largest beer company. Through the first nine months of 2017, Altria’s revenues and operating profits were dominated by its cigarette business, which made up 89% of sales and operating income, with almost all of the rest coming from its smokeless division. Wine represented just 2% of sales and 1% of operating income. This quote from Warren Buffett about the wide moat nature of the tobacco industry is precisely why Altria has been such a great high-yield dividend growth stock for so long. The company’s Marlboro brand grew to become the nation’s dominant cigarette brand with 44% market share and generates 87% of the company’s overall smokable volumes, for example. All told, Altria’s total market share is 51.1%, and its industry-leading brand equity means that it has strong pricing power to offset the 3% to 4% annual volume declines in cigarettes that have been the long-term industry trend. In fact, over the past year Altria has increased the average price of a pack of cigarettes by 5.9%, and its Copenhagen chewing tobacco has enjoyed an even more impressive price hike of 7.2%. This has resulted in steadily rising revenue and operating margins for the company, whose operating margins on cigarettes are now the highest in the industry at 51.6%. While Altria’s business is dominated by cigarettes, the company realizes that the secular decline in smoking, in which cigarette volumes are expected to decline by 3.6% annually for the next decade, is a major threat to its long-term outlook. This is why the company is focusing all its growth efforts on lower risk products, including smokeless tobacco products, iQOS, and MarkTen vaping products, which offer 96%, 95%, and 99% less health risks, respectively. The good news for Altria is that, unlike cigarettes, chewing tobacco is still a growing industry, as smokers are increasingly shifting from higher risk to lower risk products. 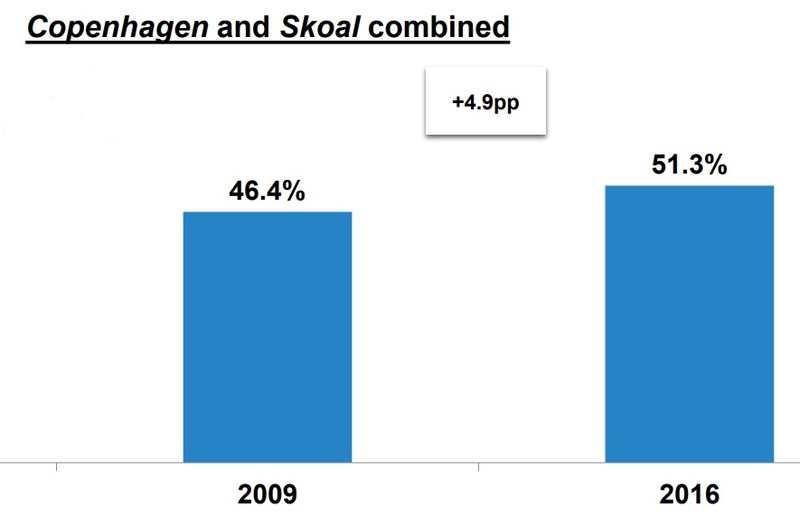 Altria owns Skoal and Copenhagen, which it acquired via its $10.4 billion purchase of US Tobacco in 2008. 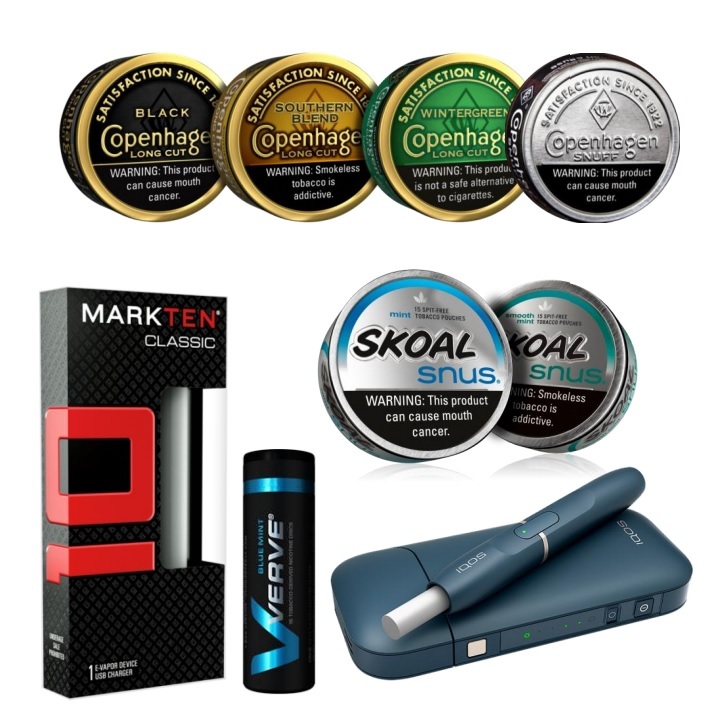 The company’s strong distribution network and industry-leading ad budget has allowed it to grow these two brands, and Altria now controls a majority of the smokeless tobacco market (55% market share) in the US and enjoys the largest operating margin in the industry (67.7%). Going forward, Altria is expanding on the low-risk tobacco market with numerous plans to launch new products across the smokeless, vaping, and heated tobacco markets. However, while Altria’s focus on lower risk products is a good and necessary long-term step, it’s going to be a long time before these growing businesses make any meaningful contribution to the company’s bottom line. For example, analysts expect e-cigarettes to only account for 10% of sales ,at best, in 10 years. And in 2024, it’s expected that 80% of Altria’s operating income will still come from cigarettes. That’s why Altria is focused on maximizing its competitive advantages by streamlining its supply, manufacturing, and logistics chains in order to continually boost its operating profits through cost reduction ($2.3 billion in annual savings over the past decade). The results have been impressive, with Altria growing its earnings and free cash flow consistently and at a high single-digit rate despite overall flat revenues. Altria’s long-term trend of steadily rising earnings and free cash flow is a strong sign of financial strength for a company that has proven itself to be extremely shareholder-friendly over the years. In fact, few companies have been as generous as Altria when it comes to returning cash to shareholders (80% Adjusted EPS dividend payout ratio policy), which has resulted in fantastic investor returns. More importantly, management is confident that its strategy of increasing operational profitability, combined with steady share buybacks, can grow adjusted EPS and free cash flow per share at about 8.5% in 2017 and 7% to 9% annually over the long-term. That should allow Altria to be a solid low risk, high-yield choice, one that’s possibly a good fit for a conservative retirement portfolio. Despite its impressive dividend and total return record over the decades, Altria faces massive regulatory risks at the local, state, and federal level. For example, local municipalities and states desperate for revenue are more than happy to continually raise tobacco excise taxes (which now consume about 26% of cigarette revenues). And keep in mind that the above, steadily rising figures are the average tax per pack. Many states have much higher rates, including up to $4.35 per pack in New York. In addition, cities can add on their own sin taxes. For example, New York City plans to raise its tobacco tax by $2.50 per pack, bringing the minimum cost of a pack to $13, the highest in the nation. High taxes are just part of the ongoing war on tobacco, which also includes increasingly stringent regulations banning smoking in bars, restaurants, and in the case of New York City, even reducing the number of stores allowed to sell tobacco products by 33%. Meanwhile, the Federal government has also been a big crusader against big tobacco, with numerous attempts to regulate the industry in ways that are designed to lower smoking rates. However, the regulatory process is extremely long, and so any phased in nicotine restrictions aren’t likely to hurt the company over the short-term. Investors can read more about this announcement, which sent Altria’s stock tumbling by nearly 20% during the summer of 2017, by clicking here. That being said, this decades long American public health crusade against cigarettes has understandably resulted in a gradual decline in smoking. For example, the US smoking rate for adults declined from 42% in 1955 to just 15% in 2015 (and is projected to hit 12% in 2020). 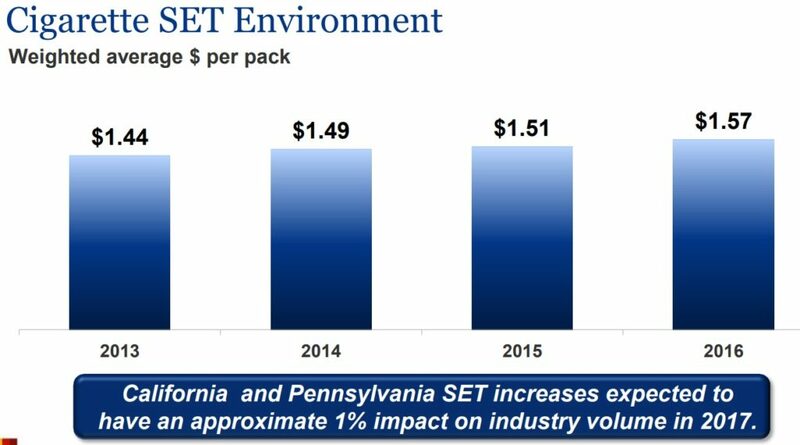 Analysts expect cigarette volumes to decline by about 3% to 4% a year. That in turn means that Altria investors are counting on three things in particular to keep their earnings, cash flow, and dividend growth alive. First, the company will need to keep raising prices to offset its falling volumes. While this is something the company has a great track record of, thanks to its wide moat and best-in-class brand loyalty, there are potentially limits to how high Altria can raise its prices. Also keep in mind that a large chunk of those price increases are due to higher excise taxes, meaning that Altria is only getting about 74% of the higher revenue from price increases. Altria’s second route to continued cash flow and dividend growth is ongoing cost cutting, which raises its operating margins and free cash flow to fund ongoing share buybacks. This combination of rising cash flow and falling share count is the only way that Altria can continue sustainably increasing its payouts despite falling volumes and flat sales. However, here too there may be limits to how much cost cutting can be accomplished, which could result in the company’s operating margin growth flattening in the future. Finally, Altria’s biggest and most important growth catalyst is arguably non-combustibles such as MarkTen and iQOS. The company’s hope is that it can transition its existing customers to these lower risk, smoke-free alternatives, and thus stabilize its revenue in the long-term. However, with vaping too, regulators are considering highly restrictive regulations. 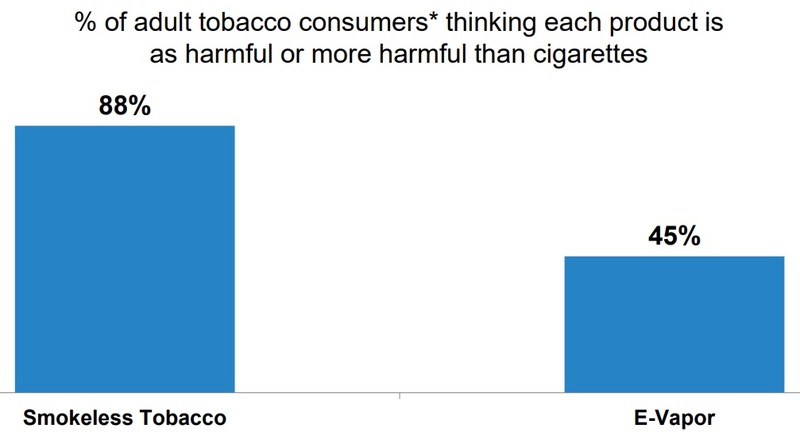 In addition, while vaping is far less risky than conventional smoking, public perception (which will ultimately drive adoption rates) doesn’t necessarily reflect this. That may explain why the US vaping market has recently stalled, and it potentially means that the vaping market Altria is pursuing may not become as large as it hopes. Meanwhile, iQOS has yet to receive FDA approval, a process whose success is far from assured, and could end up taking far longer than the mid-2018 time horizon Altria expects. Keep in mind that even if iQOS gets approval, it’s far from certain how successful or profitable the new system will be for Altria. 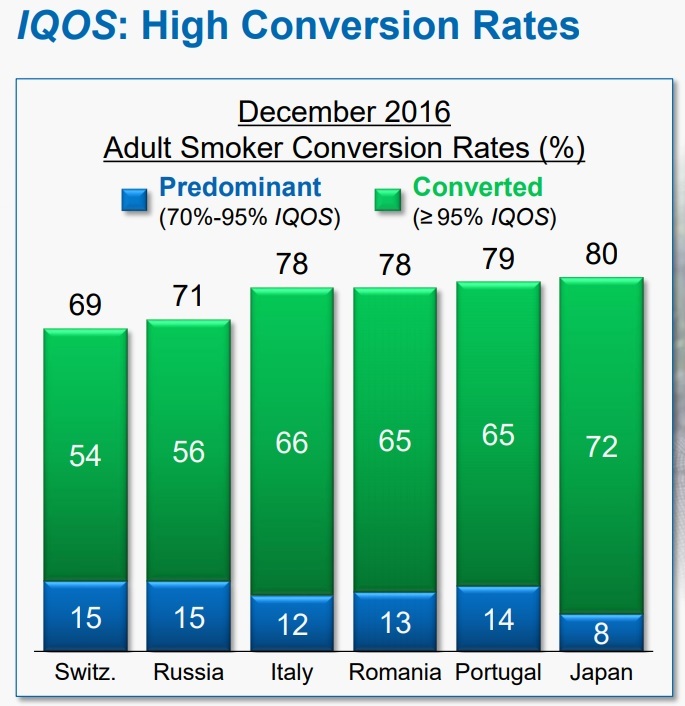 That’s because Altria is an exclusively US company, and so far international adoption of iQOS has varied significantly by nation. This means that there is a fair amount of uncertainty about how popular the system will be with Americans. Factor in the higher cost of production of iQOS units and the lower operating margins they represent, and Altria’s growth path is far from certain. The bottom line is that tobacco companies like Altria face enormous growth challenges, especially since the broad secular trend of lower smoking rates is likely to continue. With that said, few companies have proven to be more adaptable or dividend-friendly than Altria over the years. The company’s nearly half a century of growing payouts, in all manner of challenging industry conditions, still makes it a potentially attractive high-yield dividend stock. That’s especially true given that, at least for the foreseeable future, the dividend appears to remain highly safe, even for low risk income investors such as those looking to live off dividends in retirement. Altria has a Dividend Safety Score of 85, indicating a very safe and dependable payout compared to other stocks in the market. That’s what one should expect from a dividend aristocrat who is just a few short years of becoming a dividend king (50 straight years of dividend growth). The key to Altria’s consistent, steady, and safe payout growth has been management’s ability to continue growing the company’s earnings and FCF per share, despite the numerous challenges facing its core business. 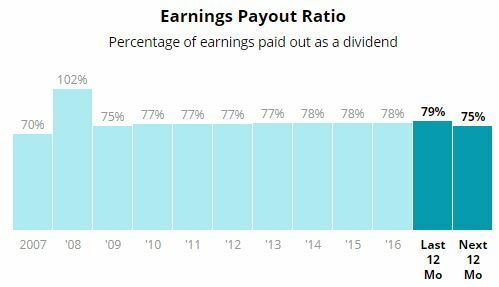 As a result, Altria has maintained a relative steady earnings payout ratio near 80%, which provides reasonable coverage for the dividend given the defensive profile of the tobacco industry. Also keep in mind that tax reform will lower the company’s effective tax rate from 35.5% in 2017 (the new corporate rate is 21%). Altria will likely see a double-digit boost to its earnings and cash flow, which will lower its payout ratio over the next 12 months and further increase its dividend safety. The other major protective factor of Altria’s dividend is the company’s very strong balance sheet. While Altria has a large net debt position, that’s actually normal for a mature and cash-rich business like this one (30% FCF margin in recent years). In fact, when we compare Altria’s debt levels to those of its peers, we find one of the industry’s strongest balance sheets. For example, Altria’s leverage ratio (Debt/EBITDA) is far below that of its peers, while its interest coverage is over three times as high. This explains its strong investment grade credit rating. In turn, Altria has plenty of flexibility to invest in the future, service its debt, and still pay a generous, safe, and growing dividend. Even more impressive than Altria’s dividend growth record, or its high safety, is the fact that it’s historically grown its payout at a solid high single-digit rate. Note that the apparent dividend cuts in 2007, 2008 and 2009 are a result of Altria spinning off various non-US tobacco businesses, such as Philip Morris International, Kraft, and Miller. In reality, Altria has raised its regular dividend (when adjusted for spin offs) 51 times in the past 48 years. Given the stable nature of the tobacco business (recession-proof and non-cyclical), investors can likely expect Altria to continue growing the dividend in line with earnings and cash flow, or about 7% to 9% a year for the foreseeable future. Over the past year Altria has lagged the S&P 500 by more about 15%, mostly due to the giant decline caused by the FDA’s announcement of its eventual phased reduction in cigarette nicotine levels. However, the stock has recovered sharply (about 15%) since then and doesn’t necessarily represent an exceptionally good value today, especially given some of the lingering uncertainties. For example, MO’s forward P/E ratio of 19.6 is higher than even the S&P 500’s rather frothy 18.5. It’s also much greater than the industry median of 18.3 and higher than the stock’s historical 14.0. 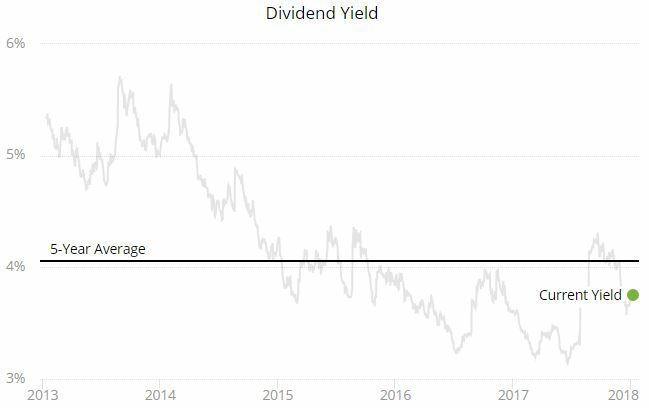 Meanwhile, MO’s dividend yield of 3.8% is below the stock’s long-term historical yield of 5.2%, as well as its five-year average yield of 4.1%. Given the stock’s somewhat elevated P/E ratio and lower dividend yield relative to history, investors considering Altria may be better off waiting for a more attractive price that pushes MO’s yield well over 4% to better compensate for some of the firm’s risks. However, if everything goes well for the company and regulatory concerns fade, the stock still has potential to generate close to double-digit annual returns, even if its multiple compresses a bit (3.8% dividend yield + 7% to 9% annual earnings growth). That’s largely due to the company’s possession of some of the strongest and most dominant tobacco brands in America. 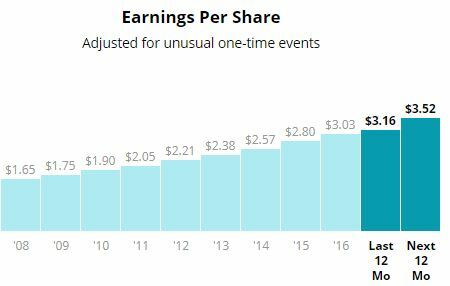 Combined with an impressive ability to cut costs, raise prices, and grow its earnings and free cash flow at solid rates, Altria could be a decent choice for dividend investors looking for higher-yielding stocks backed by relatively safe payouts. That being said, today’s valuation, while not horrible, does appear a bit rich, which means that waiting for a better price may be in order for conservative investors.